Each year, the Radiological Society of North America (RSNA) annual meeting offers an invaluable opportunity for continuing education, professional networking, and updates on new and exciting developments in the fields of radiology and imaging research. 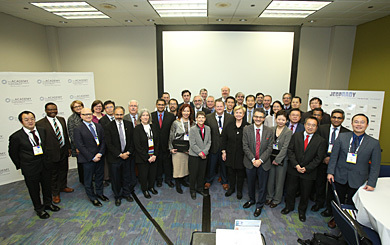 At RSNA 2018, the Academy hosted several meetings and events and made important strides in advancing development of an Academy initiative: Building the Diagnostic Cockpit of the Future (DxCP), a long-term priority that will revolutionize the way imaging data are integrated with other medical data to enable more efficient and precise diagnosis and treatment. The DxCP initiative's key leaders met to discuss goals for 2019 as well as the approval and upcoming announcement of the DxCP official task force. The Academy's most recent white paper on the DxCP initiative will soon be published by Academic Radiology. On behalf of the Academy, I would like to express sincere thanks to our Board of Directors as well as our industry partners on the Academy's Coalition for Imaging & Bioengineering Research (CIBR). We look forward to continuing our work together to advance radiology and imaging science. Imaging Shark Tank winner Dr. Srini Tripandpani (middle) with co-researcher Carson Wick, PhD (right), and Bram (Jacob) Stolk, PhD, MBA the Academy Board of Director's Industry Representative from Global Research Organization, GE Healthcare (left). a fun and interactive educational opportunity for researchers to test their skill at pitching new technology or product development ideas to a panel of experts from industry, venture capitalism, and academia. Each pitch lasted 5 minutes and was followed by feedback and questions from both the panel and the audience. Fifty academic member departments of the Academy were invited to nominate someone to pitch their idea at this session. Our expert panel chose three of these nominees. First, from the University of Alabama at Birmingham’s Department of Imaging Informatics and our winner: Dr. Srini Tridandapani presented his pitch for “Camerad”, a patented technology that integrates point-of-care patient photographs with diagnostic imaging studies, which leads to increased detection of patient errors and improved efficiency. Next, from Stanford University, Dr. Sandip Biswal & Dr. Michelle James presented their product “Painseek”, a pioneering approach to diagnosing and treating the many millions suffering from chronic pain. Their use of highly specific first-in-class PET tracers will help to identify pain generators within their holistic pain clinic. Lastly, Dr. Jesse Courtier & Dr. Ben Laguna, from the University of California, San Francisco, presented “HoloSurg3D”. Their pitch highlighted a product that provides patient-specific, made-to-order Augmented Reality models for pre-surgical planning, training, and patient education. Our expert panel judged each presentation using the Likert scale of grading, which was incorporated into a presentation rubric. All participants received a rubric with feedback to take with them and the opportunity to reach out to the panelists individually after the session. We encourage you to consider nominating someone from your department next year for this exciting opportunity or inviting members of your department to attend this session! Congratulations to Dr. Tripandpani and to all of this year’s contestants for their participation in this event! We would also like to extend our thanks to the expert panel: Ronald Arenson, MD, Chair Emeritus, Department of Radiology and Biomedical Imaging, UCSF, Bram (Jacob) Stolk, PhD, MBA, Global Research Organization, GE Healthcare, Scott Penner, JD, Senior Counsel, Foley & Lardner LLP, San Diego, & Christopher Hess, MD, PhD, Chair, Department of Radiology, UCSF. 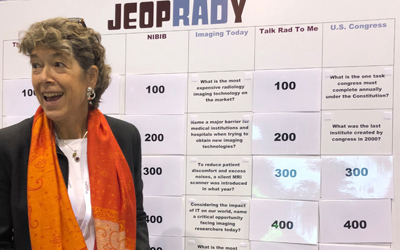 Martha Nolan, Senior Director of Government & Strategic Affairs presents JeopRADy, designed to engage RSNA participants and spread word of the Academy's mission of advocating for imaging research in Washington, D.C. This year the Academy booth focused on raising the profile of our advocacy work in support of federal funding of NIH in Washington DC. In addition to the opportunity to send their Members of Congress a letter in support of NIH funding, staff engaged attendees with an interactive and educational “JeopRADy” game, in which players answered trivia questions about; The Academy, NIH, NIBIB, Imaging Today, Radiology History, and U.S. Congress. This new twist on an old favorite proved to be a great tool in educating attendees on the importance of advocacy. It was an honor to present the 2018 Gold Medal Award to Dr. Ronald Arenson, Chair Emeritus of the Department of Radiology and Biomedical Imaging at the University of California, San Francisco. 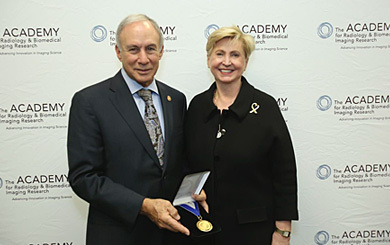 Dr. Arenson was chosen for this award in recognition of his decades-long commitment to the Academy’s mission and initiatives and for his pioneering work in imaging informatics. Academy President, Dr. Hricak, presents the Academy's 2018 Gold Medal award to Dr. Ronald Arenson. 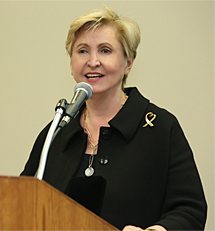 Additionally, we recognized 42 Distinguished Investigator awardees, each of whom we hope to engage in our efforts to advance the Academy’s mission of educating policymakers about the value and impact of imaging technology for patients, and advocating for strong federal funding to support imaging research. Congratulations to Dr. Arenson and to our 2018 Class of Distinguished Investigators! Congratulations to the Academy's 2018 Class of Distinguished Investigators!